Elizabeth: I'm voting for Dukakis. Q: How do I understand this movie? Q: In one shot the camera lingers on a group shot with a *much* younger Roberta Sparrow shown. Why? Q: Who is the jogger in the red tracksuit? "Yes, I am scared and I am confused. But I think you are the f**king antichrist!!!" Of course, this movie far from polarizes its characters (indeed, polarization is the last thing this film wants to accomplish) and the majority are just a mishmash of the beautiful and the grotesque: Donnie's parents, who are at the same time loving and perpetually confused; the aforementioned self-helper Jim Cunningham, who is desperate to spread the lie that keeps him sane to everybody else; and Donnie's sister, struggling between her identity as an adult and her identity as a child. And then there's Frank. All I can say here is that nothing can prepare you for or adequately describe Frank. Probably the best thing about this movie, though, is its incredible emotional range. It manages to inspire hope, love, dread, laughter, and tears at different points throughout the movie without making you feel least bit like there is a contradiction between those states. 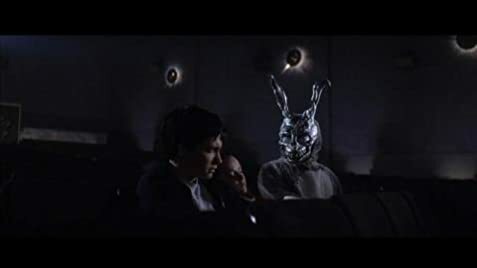 The scenes with Frank (especially the one that takes place in the therapist's office against the backdrop of a conversation about the end of the world) are quite frankly some of the scariest things I've ever seen in a movie, as they literally made my skin crawl. Finally, the performances in this film are exquisite. The talent in this film is top notch and even Gyllenhall is just amazing. That said, though, this film has a dismal future. Combine the fact that the large majority of the moviegoing public is just going to find it unbearably weird with the fact that the movie begins with part of an airplane crashing into a building (this has got to be the very definition of bad timing) and it's pretty clear that this film is going to stay underground. 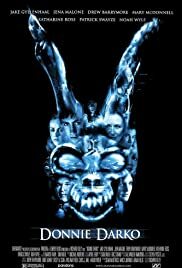 However, if you are looking for a beautiful experience with a unique film, _Donnie Darko_ is just about as good as it gets. 884 of 1,135 people found this review helpful. Was this review helpful to you?